This communiqué summarises the meeting of the A400M Partner Nations (UK, France, Germany, Belgium, Spain, Luxembourg and Turkey) chaired by [UK] Minister of State for Defence Procurement on 5 February 2018. Ministers from the A400M Partner Nations had a productive meeting with industry representatives. The discussions focused on the progress and the next steps on the A400M programme which is already delivering much welcomed initial operational capability to several of the Partner Nations Air Forces. All Nations and Airbus have signed a high-level Declaration of Intent to re-baseline the A400M programme, reflecting the latest status of the production and capability delivery plans. 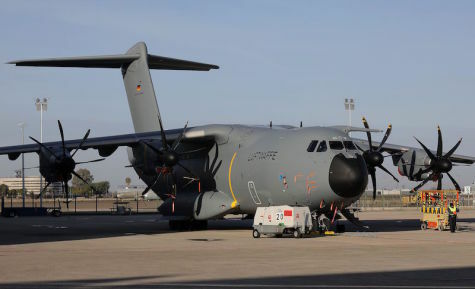 AMSTERDAM --- Airbus SE has signed a Declaration of Intent (DoI) with the A400M Launch Customer Nations (Germany, France, United Kingdom, Spain, Turkey, Belgium, Luxemburg) defining the framework for achieving a mutually binding contract amendment later in the year. Airbus, European defence agency OCCAR and the Customer Nations have agreed to work on a number of contractual elements including a revamped delivery plan as well as a roadmap for the development and completion of military capabilities for the A400M. The DoI, finalised today, represents an important step towards reaching a contractually binding agreement with OCCAR and the Launch Customer Nations in 2018 to mitigate risks and to ensure the future of the programme. OCCAR is managing the A400M programme on behalf of the seven Launch Customer Nations. This Declaration of Intent provides a new baseline on which to evaluate the A400M contract. An increase to the Loss-Making Contract provision on the programme, which may be material, is under assessment for the Full Year 2017 results which will be disclosed on 15 February 2018. With a clear roadmap in place, the remaining exposure going forward would be more limited. "This agreement with our customers is an important step to further mitigate risks remaining on the A400M programme. I thank the nations for their support in this complex effort and hope for their continued engagement until we sign a mutually beneficial contract amendment," said Tom Enders, Chief Executive Officer of Airbus. "On this basis, Airbus remains committed to the A400M and to providing our customers' air forces with the best-ever military transport aircraft. However, since its inception in 2003, this programme has suffered not only from a number of operational issues but, more importantly, under a flawed contractual set-up and insufficient budget which resulted in significant losses for Airbus as prime contractor. We have a good chance to stop or at least reduce the bleeding now and deliver the capabilities our customers need." In February 2017, Airbus called upon the Launch Customer Nations to engage in discussions with respect to readjusting the contractual set-up of the A400M, one of Europe's most important and largest joint defence collaboration programmes ever. During a Ministerial conference on 30 March 2017 in Madrid, the Launch Customer Nations expressed their willingness to support such a dialogue and to enter into contract adjustment discussions with Airbus. Since then, Airbus and OCCAR have set up a number of working groups assessing areas requiring adjustments such as delivery planning as well as the military capabilities development roadmap, the results of which have led to today's DoI. In view of the ongoing confidential discussions required to reach binding terms, both parties have agreed to refrain from further comment. Airbus is a global leader in aeronautics, space and related services. In 2016 it generated revenues of €67 billion and employed a workforce of around 134,000. Airbus offers the most comprehensive range of passenger airliners from 100 to more than 600 seats and business aviation products. Airbus is also a European leader providing tanker, combat, transport and mission aircraft, as well as one of the world's leading space companies. In helicopters, Airbus provides the most efficient civil and military rotorcraft solutions worldwide. Ministers from the A400M Partner Nations had a productive meeting with industry. We discussed the progress and the next steps on the A400M Programme which is already delivering much welcomed initial operational capability to several of the Partner Nations' Air Forces. All Nations and Airbus have signed a high-level Declaration of Intent to re-baseline the A400M Programme reflecting the latest status of the production and capability delivery plans. On Monday, the nations that make up the A400M aircraft consortium met in London to confirm the viability of the project. Representatives from Germany, Belgium, Luxembourg, France, the United Kingdom, Turkey and Spain attended an inter-ministerial meeting in which OCCAR (Organisation for Joint Armament Co-operation) and industry (Airbus Defence & Space), also participated. For Spain, the meeting ensured the viability of the FAL (Final Assembly Line) of San Pablo, Seville, during the next decade, as well as an extension of the deadline of the decision on the final destination of the last batch of these aircraft. This meeting is part of the contacts and regular meetings and exchanges between program participants. The A400M is a new-design transport aircraft that is at the forefront of technology developments, and offers multiple possibilities for interoperability and operational efficiency. It is fundamental for the missions of the Spanish and European Armed Forces. Representatives of the governments participating in the A400M program have held a productive meeting in London this week in this regard. Throughout the session, progress in the program was analyzed; at present, the A400M has already attained initial operational capacity in the air forces of the consortium nations. All the participating nations and Airbus have signed a high-level declaration of intent that allows planning for the future of the A400M program, in accordance with the latest production stages and the capability delivery plan. The member countries have agreed to meet again in 2018 in order to review the progress of the program.